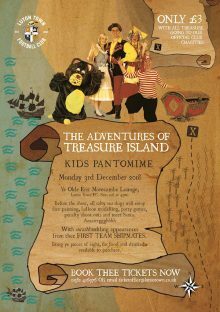 The football club’s pantomime has become a firm favourite since it was introduced it a few seasons ago, and this year’s show “The Adventures of Treasure Island” looks set to continue the trend on Monday 3 December at 4pm. Tickets cost just £3, with the treasure proceeds split equally between three charities, including Luton Foodbank. Before the show begins, there will be face painting, balloon modelling, party games, penalty shoot outs, and a chance to meet Father Christmas.